Israeli police have prevented former nuclear technician Mordechai Vanunu from leaving Jerusalem to visit Bethlehem for Christmas. Vanunu, a Christian convert, had tried to defy a travel ban to pray at the Church of the Nativity. He was taken into custody but freed again on Saturday. Mordechai Vanunu served 18 years in jail for disclosing details of Israel's nuclear programme, and was released in April under strict conditions. Palestinian leaders were at the church in the town of Jesus's birth for the famed mass and celebrations, which drew hundreds of pilgrims and others. Vanunu was ordered to post bail of 50,000 shekels ($11,500) and to remain at his lodgings at Saint George's Anglican cathedral in Jerusalem for the next five days. He had been stopped on Friday in a van bearing the letters TV - indicating a press vehicle - at a checkpoint between Jerusalem and Bethlehem. Police said a vehicle search had revealed only a Father Christmas hat. "He said he wanted to pray at the Church of the Nativity on Christmas Eve, even though he knew it was illegal for him to leave Israel," police spokesman Gil Kleiman said. Israel insists Vanunu still poses a security threat and he is banned from leaving Israel - including visiting the West Bank and Gaza Strip - or talking to foreigners without permission. 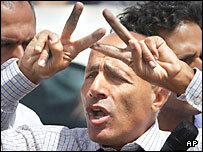 Vanunu was also briefly arrested for breaching restrictions on talking to foreign media six weeks ago. Following his detention and subsequent order to remain under house arrest, some high-level supporters including the Anglican Bishop of Jerusalem and UK politicians accused the Israeli government of harassment.